The first presidential debate Monday night offers Donald Trump and Hillary Clinton an opportunity to explain their positions on important issues facing the country. 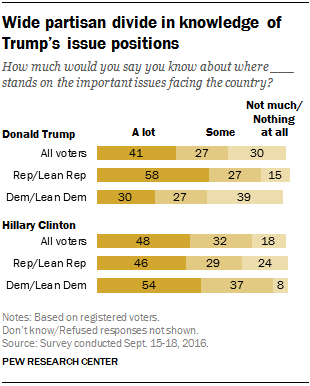 Two months after the party conventions, only about half of voters (48%) say they know “a lot” about where Clinton stands on important issues, while even fewer (41%) say this about Trump. A new Pew Research Center survey of 1,000 U.S. adults, including 802 registered voters, conducted Sept. 15-18, 2016, finds that overall interest in the debates is similar to levels in recent elections: 60% of voters say they are very likely to watch the upcoming debates, while another 19% say they are somewhat likely to watch. When it comes to knowing where the candidates stand on major issues facing the nation, voters say they know more about Clinton’s positions than Trump’s: 48% know a lot, 32% some, and just 18% know not much or nothing about Clinton’s stances. By contrast, voters are 12 percentage points more likely to say they know little or nothing about Trump’s positions (30%), while 41% say they know a lot and 27% know some. Republicans and independents who lean toward the Republican Party are roughly twice as likely as Democrats and Democratic leaners to say they know a lot about where Trump stands on important issues (58% vs. 30%). Nearly four-in-ten Democrats (39%) say they know little or nothing about where he stands. The partisan divide on knowledge of Clinton’s positions is less pronounced. Just over half of Democrats (54%) and 46% of Republicans say they know a lot about where Clinton stands. So if many voters are still learning about where the candidates stand on major issues, what do they want them to talk about in the debates? A Pew Research Center survey conducted in June asked 3,767 registered voters to imagine they were moderating a 100-minute national debate between Trump and Clinton and to allocate that time across 10 issue areas. In that survey, voters allotted more time to discussions of the candidates’ plans on keeping the U.S. safe from terrorism and economic growth and much less time to discussion of abortion policy or Supreme Court nominations. 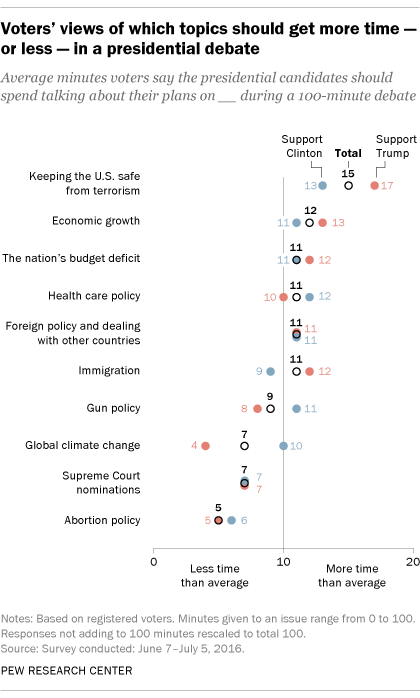 Both Trump and Clinton supporters wanted to hear more debate on terrorism compared with other topics, but Trump supporters were especially interested in this topic. They were also more interested in hearing about immigration than Clinton supporters (allocating an average of 12 minutes vs. 9 minutes). Clinton supporters, by comparison, were somewhat more likely to allot time to discussion of gun policy (11 minutes vs. 8 minutes by Trump supporters) and much more likely to devote time to discussing global climate change (1o minutes vs. just 4 minutes by Trump supporters). Note: The methodology and topline for the Sept. 15-18 survey are available here (PDF).